This is an old modifications I did a few years ago. 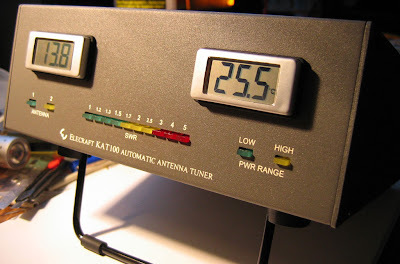 I moved the KPA100 amp of my Elecraft K2 together with the KAT100 antenna tuner into an EC2 enclosure. The front panel of the combo is normally occupied only by the LED indicators and SWR meter of KAT100 and it looks somewhat empty. I decided to install a digital voltmeter showing the voltage of the power supply and a digital thermometer indicating the temperature of the KPA100's heatsink. Both values are important for the proper operation of the amplifier. K2 has a built-in voltmeter but it shows lower-than-actual value because of the voltage drop across the reverse-polarity protection diode. An accurate voltage is also needed for proper charging of the internal SLA battery. The temperature sensor of KPA100 "knows" only when to turn the fan on, but doesn't display the actual temperature of the finals, which is critical, especially during lengthy CW or digital modes sessions! I got two LCD meters from Martel Electronics - http://www.marteltesttools.com/products.php?cat=113&action=detail&id=69 - QM-100V (voltmeter 4 - 25V) and QM-110T (thermometer with internal and external sensors, Fahrenheit or Celsius). Installation is very simple! Each meter requires a single 5.5 mm (7/32") hole in the front panel. I left space in the middle, should I need to install other things on the front panel - switches, LEDs, meters, etc. I made a custom wiring harness with shielded cable, which powers both meters. Ferrite toroids are installed to suppress any RF noise in the power. Small 3 pin jack is used toconnect the front panel meters to the KPA100 module ( ground, power and external temperature probe). This allows for an easy disconnect and removal of KPA100. This is the configuration jumper of the digital thermometer. The meter has two control inputs - when grounded, one is used to switch the display between Celsius and Fahrenheit and the other is used to specify which sensor is in use - internal or external. The meter has an internal sensor but for accurate measurements an external one should be installed. The external sensor is simply a 10 kOhm NTC precision thermistor, attached to the heatsink of the amplifier (near the speaker). I made a small bracket out of thick copper foil to attach the thermistor probe. I applied some thermal compound between the thermistor and the bracket and between the bracket and the heatsink. 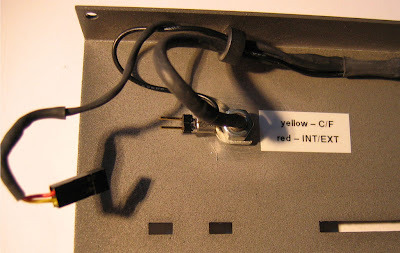 Small diameter shielded cable (RG-174) connects the thermistor to the female jack. I used thermistor from Mouser - Part# 594-2322-640-63103 (now obsolete part but there are other replacements). This the final look of the front panel! Now I have an accurate voltmeter displaying the voltage of my bench power supply and thermometer for the finals of the amplifier. Both meters are splash-proof (there is a thin rubber gasket between the meter and the front panel). They stick out just a little bit (5 mm) from the front face of the panel. On the back of each meter there is a small adjustment screw for calibration. I calibrated the voltmeter using my NIST traceable calibrated Fluke and it is "dead on" accurate now. The thermometer was calibrated using an accurate industrial thermometer. The external temperature sensor must be calibrated for the specific thermistor used to compensate for the manufacturing tolerance! The internal sensor is located in the meter housing and it is factory calibrated (there is calibration adjustment for it as well) - it can be used to show the temperature in the shack (if the radio is powered but not used for Tx). If used as a shack thermometer, there might be a small measurement error if the finals are hot due to proximity of the sensor. Small front panel switch can flip between shack/finals temperature. I don't need a shack thermometer since I already have one in my WavPro Luminator so I didn't install such switch. I've been using this mod for about 3 years now with no problems! Nice blog I came accross the blog when searching "LP-100A power meter". Thank you for the very nice mod and the link to the parts, (Always very helpful!). 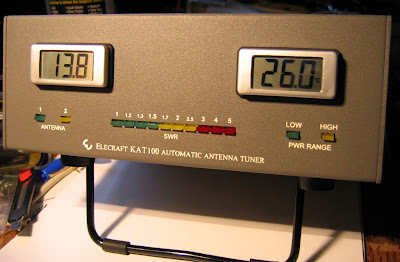 These meters will work great in the EB-63 based amp project I am working on. Look for the "Drill Mountable Panel Meters" which means all you have to do is drill a 7/32" hole--no nibbling or filing a rectangular hole!